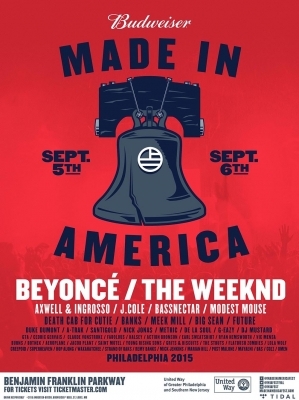 The lineup for Jay Z's Budweiser Made in America festival has been announced. The music festival will be held on Labor Day weekend, Sat/Sun September 5th and 6th on the Ben Franklin Parkway at the Art Museum. Beyonce and The Weeknd will headline the two nights. Other acts of note include Axwell & Ingrosso, J. Cole, Bassnectar, Modest Mouse, Death Cab For Cutie, Nick Jonas, Metric, Future, and Philly's Meek Mill. The lineup also features other Philadelphia acts including Santigold, Creepoid, Waxahatchee, Strand of Oaks, Hop Along, and Marian Hill. Pre-sale tickets starts on 6/25 at 10 am.